In 1815. From Mobilisation to war, the first volume in a series of four to be completed by 2015, Erwin Muilwijk has made a commendable attempt to cover a fairly unknown aspect of Dutch military history. The period of March up until the resumption of hostilities on 15 June 1815 is one that has thus far received scant attention of both Dutch and international historians. It was marked by frantic efforts of the Dutch general staff and king Willem Frederik, Prince of Orange, to rebuild the Dutch armed forces into something resembling an army. An army that needed to be built up from scratch, both to ensure the integrity and survival of the Dutch state and to give Willem Frederik enough political leverage to play a serious part in post-Napoleontic European politics. The brief return of the French Emperor from exile and his renewed attempts at defeating the Coalition forces added urgency. 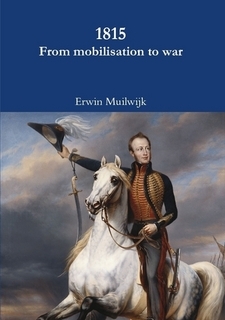 In the first six chapters of 1815, Muilwijk sheds light on the struggle of the Coalition to come up with a clear strategy for the defence of the southern provinces, in which the views of the Dutch general staff differed considerably from those of Arthur Wellesley, Duke of Wellington. The rest of the impressive number of twenty remaining chapters is devoted to a wide variety of different subjects, including troop inspections, garrisoning, the disturbance of Wellington’s ball on 15 June, etc., culminating in the fighting on the first day of the Waterloo campaign. Aside from the, what some might consider, overabundance of chapters for a book of this size (245, excluding the appendices, lists of maps, bibliography and such), the table of contents reveals an important flaw. A clear conclusion or epilogue is lacking. This shortcoming could have been remedied by providing a (short) conclusion at the end of each chapter. As a result, although Muilwijk has clearly spent a tremendous amount of time and effort on the collection of source material, it remains somewhat unclear what historiographical voids he has actually set out to fill. Another, relatively minor fault is the arrangement of the various notes. The relatively short chapters are interspersed with long lists of sources and accompanying texts, that do little to improve readability. This can be solved however, by providing a(n abbreviated) list of sources at the end of future volumes. The abovementioned lack of a conclusion too, can easily be solved by including an overarching conclusion in the fourth and final volume. As mentioned above, the amount of source material used is nothing short of impressive, of great variety and, apart from one remarkable omission, quite complete. This is the omission of W.E.A. Wupperman’s De vorming van het Nederlandsche leger na de omwenteling van 1813 en het aandeel van dat leger aan den veldtocht van 1815 (Breda 1900) dealing with the same period and much the same subject as Muilwijk has done. This, apart from the earlier mentioned relatively minor issues, is a shortcoming that needs to be addressed in the following volumes. Nevertheless, the amount of sources used is nothing short of massive. One particularly interesting element in 1815 is the inclusion of many personal accounts, both from the ‘top’ and ‘bottom’ of the Dutch (and other Allied) armed forces. These accounts would however in some cases have been more colourful if presented in their original languages, but their translation to English aids the works’ appeal to international readers. On the upside, Muilwijk has delivered a well written and enthusiastically compiled and presented account of a relatively obscure episode in Dutch (military) history. It is richly illustrated and his descriptions of battles and troop movements clarified by the inclusion of maps – drawn by the author himself. Muilwijks’ efforts have, despite the earlier mentioned flaws, largely paid off. With 1815. From mobilisation to war he has delivered a fascinating account of a rather obscure episode of Dutch military history. It would be interesting to see what the author has in store in the next three volumes. The second and third of which have already appeared (in May 2013 and July 2014 respectively). In the first one Muilwijk has certainly shown that the build-up of the Dutch armed forces, and their contribution to the Waterloo campaign, deserves much more attention from historians and the general public than it has so far. Hopefully this work, and the following three volumes, will be an incentive for both.